The Taksim Square Pedestrianization Project has brought the monuments of 'roadside urbanization' right into the heart of Istanbul. The cause of the wave of mass protests which took Turkey by storm last June is often attributed to the ‘uprooting of five trees in Istanbul’s Gezi Park.‘ The construction project which required that uprooting is now complete. Called the ‘Taksim Square Pedestrianization Project” and carried out by Istanbul Metropolitan Municipality, the works took a little less than a year to finish. The resulting sea of concrete that reigns over the square might be a little too Tiananmenesque to the local eye. But arguably more familiar and equally iconic is the set of automobile underpasses introduced by the project. Their ‘iconic-ness’ stems from the fact that they extend well above the underground through a series of ventilation shafts and guardrails which now mark the ‘pedestrianized’ square. Familiar they are, for they have in the past two decades become an inseparable element of peripheral urbanization in Turkey. This familiarity is evident in the colloquialism ‘battı-çıktı’ (literally, ‘submerged-surfaced’) after which these structures have come to be called. The battı-çıktı’s journey from the outskirts of Turkey’s urbanization into its heartland raises a set of questions regarding the architectural and political significance of that which is otherwise taken for granted as mere ‘infrastructure’. Underpasses tend to make much more sense when constructed outside urbanized areas. The situations that require the construction of such underpasses are generally twofold. The first is when the paths of cyclists and pedestrians have to intersect with highways. In this case, the underpass serves the former groups of users and thus enables both a safe crossing and uninterrupted vehicular traffic. The second case consists of encounters between wildlife and motor vehicles. Here, the motor way is brought underground in order for the flora and fauna to be protected. 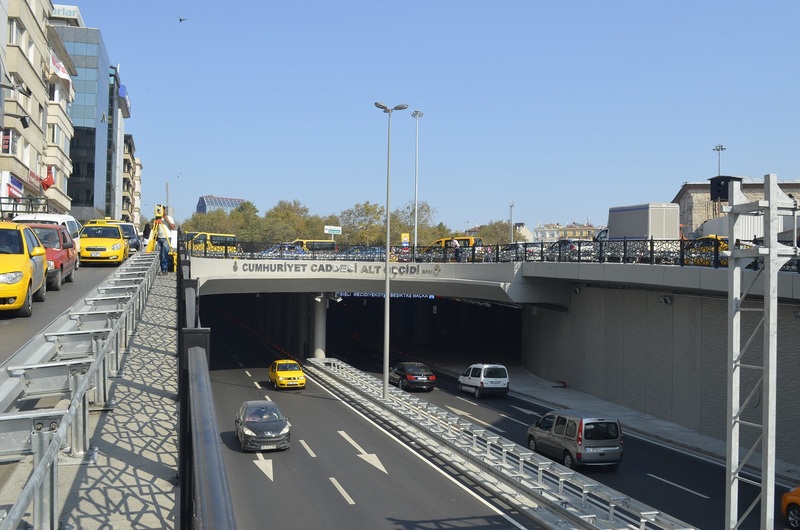 While neither case applies to the recent development in Istanbul’s main square, there are but few examples resembling Taksim where underpasses are constructed in areas of dense urbanization. Even then, these vehicular tunnels prove to be more a nuisance than an effective solution to traffic problems. Consider Manila whose city hall fronts Lagusnilad, one of the world’s oldest vehicular underpasses. The recent Monsoon affecting the Philippine capital left Lagusnilad dysfunctional, as the underpass was submerged in water. So much so that Manilans began calling Lagusnilad an olympic-size swimming pool. Besides the question of whether Istanbul needs new olympic facilities in the wake of its recently failed attempt at hosting the 2020 events, the situation in Manila evokes another story that was recently in the news in Turkey. Reporting a man who cast a fishing line into a flooded battı-çıktı in the southern city of Isparta, the story suggests that the people of Turkey are gaining competence in dealing with failed underpasses. But to completely dismiss the building of underpasses in city centers as nonsensical would be to overlook their contribution to Turkey’s urbanization. For, the first battı-çıktı examples came about as a response to the problems introduced by a practice of urbanization unique to Turkey, one which may be called ‘roadside urbanism’. The story of this practice begins in the 1980s and 1990s when informal settlements began mushrooming in the fringes of large cities like İstanbul, Ankara and İzmir. Istanbul’s accelerated expansion near end of the century caused these settlements to become much more visible and thus undeniable, which brought about the need for their formalization. Part of the formalization consisted of urban planning, one which would introduce a certain degree of ‘planned-ness’ but would still reflect the gradual nature of the growth which is characteristic of these areas. Underpasses were key to this moderate approach to planning. Not only did they provide road safety but they also turned the area acquired from the moving underground of vehicular traffic into something of a public space, and in turn, addressed an important need in these idiosyncratically urbanized areas. 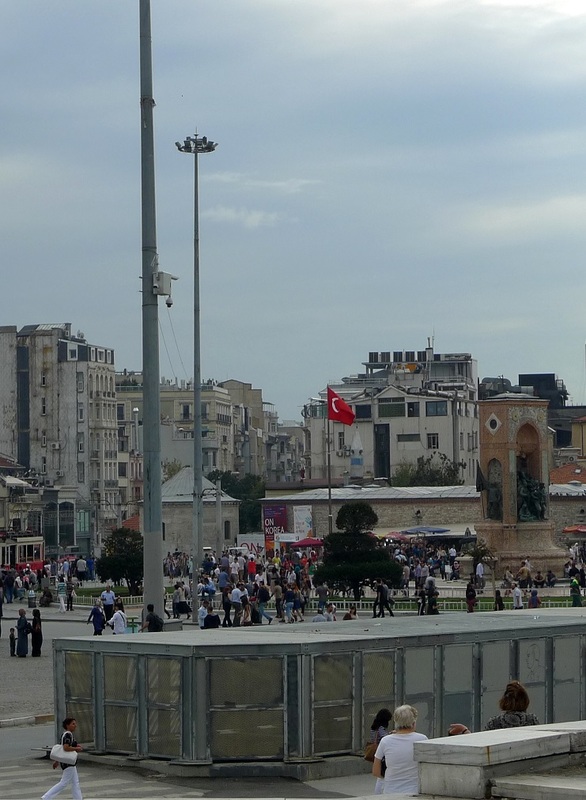 To be sure, the case of the urban periphery is not applicable to Istanbul’s main square Taksim. There are obvious differences between the two areas’ respective histories of urbanization. But a more practical reason behind the inapplicability concerns the characteristics of vehicular traffic in the center and those in the periphery. In the case of ‘roadside urbanism’, the area occupied by non-vehicular traffic is much smaller than the field of virtually ubiquitous pedestrian presence in Istanbul’s urban core. This means that in the periphery, the avoiding of deceleration for drivers, which the vehicular tunnel enables, might not be so important a problem for pedestrians. But in an area such as Taksim, the inclusion of underpasses and the resulting encouragement of vehicular speed mean that those who choose to walk are exposed to a much larger threat than before, invalidating the very claim of ‘pedestrianization’ itself. Looking at the new Taksim, it is impossible not to be reminded of the artist Robert Smithson’s notion of ‘ruins in reverse’. The artist develops the notion in a 1967 essay in which he reflects on a day-trip into New Jersey suburbia, entitled ‘a Tour of the Monuments of Passaic‘. The buildings which the artist presents in the essay as ‘monuments’ are not magnificent statues or stately palaces. Instead, ‘the Monuments of Passaic’ for Smithson are bridges, sewage pumps, and drilling rigs, most of which are still under construction. Monuments they are, because these seemingly only infrastructural objects in effect render historically significant the suburb which is otherwise deprived of the grand events and narratives of history. Moreover, this monumentality benefits from a ruin value, albeit ‘in reverse’. For Smithson, these monuments are ‘ruins in reverse’ because they complicate the often ‘discredited idea of time’. Instead of falling into ruin after being built, according to the artist, these monuments ‘rather rise into ruin before they are built’. In other words, the seemingly never-ending construction of these large scale projects is itself the historical event which the suburb lacks. When faced with criticism on the recently completed pedestrianization project, Turkey’s Prime Minister Tayyip Erdoğan suggested that ‘the project is only partly complete’ and called on people to ‘wait until the end,’ as ‘there is still the extra-time’ and ‘we shall continue playing’. Indeed, his government’s approach to urbanization could not have been articulated better. For, it is an approach that renders cities a continuous construction site, where ‘extra-time’ never runs out on projects that are hastily begun but lack clear direction. As ventilation shafts, guardrails and underpasses— ‘ruins in reverse’ of peripheral urbanization—make their way into Turkey’s urban heartland, such is the approach that materializes in the new Taksim Square. *Post-script: Just after this article was written, heavy rain turned Taksim Square into a conglomeration of puddles and, a few days later, a motorcyclist lost his life in one of the underpasses in an accident. This article was originally published in Turkish, in the 52nd issue (October 2013) of Tasarım newspaper. Eray Çaylı is a Doctoral candidate and tutor in Architectural History at University College London.